Vistage purchase the Academy for Chief Executives in the U.K.
Vistage, the world’s leading CEO peer advisory organisation with over 22,000 members in 20 countries worldwide, signs agreement to purchase the Academy for Chief Executives in the U.K.
LONDON (April 9, 2018) – Today, Vistage announced that a deal has been signed to acquire the Academy for Chief Executives, a leading U.K. CEO development organisation, dedicated to improving lives by unlocking the potential of every business leader. This partnership will grow the Vistage community of CEOs and business leaders, solidifying its position as one of the top CEO organisations in the world. Vistage already has a significant presence in the U.K., but this development will create a collaborative community in the U.K. of over 100 Chairs and 1,800 members, supported and connected by the resources and programmes of a global brand. Bringing the communities together enables Vistage to advance its vision of becoming the world’s most trusted resource to CEOs and key executives, helping them become better leaders and deliver better results. Vistage’s purpose is to help high-integrity leaders make great decisions that benefit their companies, families and communities. The Academy’s talented Chairs, and its hundreds of loyal and successful members will help advance that purpose, benefiting from a wide range of events, online resources, market research, and learning and networking opportunities within Vistage. At the same time, their combined experience and expertise will raise the bar and strengthen the Vistage community. Vistage CEO Sam Reese says both companies have a shared mission to improve the effectiveness and enhance the lives of CEOs and key executives, and that this was a primary driver for the acquisition. “The bottom line is that we share the same goals, and have very similar principles. Our strategy must always be rooted in member value; expanding our membership with quality members and Chairs contributes richness, diversity, wisdom and added value to all in our community, both within the U.K. as well as globally,” says Reese. Vistage is an organisation designed exclusively for high-integrity CEOs and executive leaders who are looking to drive better decisions and better results for their companies. Our members — 22,000 strong in more than 20 countries — gather in trusted, confidential peer advisory groups where they tackle their toughest challenges and biggest opportunities. Leveraging the Vistage platform, our members have demonstrated the ability to refine their instincts, improve their judgment, expand their perspectives and optimise decision making. CEOs who joined Vistage grew their companies at over twice the rate of the average company, according to a 2017 analysis of Dun & Bradstreet data. 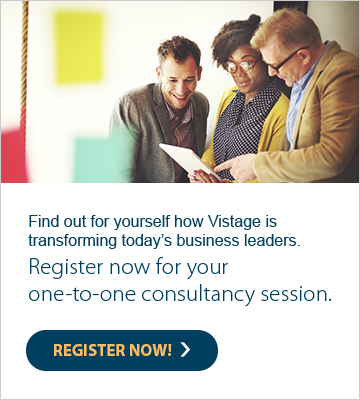 Learn more at vistage.com. We believe in improving lives by unlocking the potential of every business leader.We deliver this by fast track learning via three mechanisms; world class speakers, peer to peer learning with other successful business leaders and one to one coaching, mentoring and guidance. Ultimately we enable successful business leaders to achieve more from themselves and their business. Our members consist primarily of U.K. based business leaders, Chief Executives or Managing Directors, owners or employed leaders of companies with a minimum of £5 million turnover and at least 20 employees.